Here's the girl, happy as could be in her coach. Next stop Daisies, then back to Velorution. It's been a wonderful few days with the trike, and I think it's put us in a good position to order one! More about that soon. It was perfect weather for our last ride withe the trike today - steady rain! I put on my waterproofs and got Gem psyched for a ride in the rain. When we came down, I had prepared the trike with the top cover and one side on. I started talking about riding in her special coach, and she went right in with happy squeals. I showed her that she could see out both sides, the front and me throu the back, and we were ready to go. The trike handled great in the rain - no diffs anywhere. Gem really enjoyed the ride, too, singing to herself and enjoying her raisins all the way. This year, London's Bike Week and Architecture Week coincided, and there was a great series of architecture bike tours around London. I did the one last Thursday called "The changing face of London: Urban Change and Regeneration". I'd covered most of the area before (around Kings Cross, and all over the new bits of Southwark near the Thames) already, but the weather was gorgeous and it's always nice to go for a group ride. Still having a great time with the Christiania! The nursery run went great on Thursday. Today, we rode up to music class, then we gave some rides to a couple of Gem's friends from class. Everybody had a great time! It was interesting to see how she reacted to biking about not buckled or helmeted - she actually picked up the helmet and put it on, and held on very responsibly in the box. When we got home, once again, she didn't want to come out. I was amazed to find that there were really no good, close-up photos of Christiania trikes on Flickr or elsewhere before I hired this one. So I've put together a little gallery about this rental one; of course, if we buy our own, I'll do many more. I had a big revelation this morning. One of the niggling concerns I'd had about the Christiania involved my left knee, which has given me various troubles since the mid-90s. My knee hurt quite a bit going up stairs last night, and it was almost certainly because of my use of the trike. Since I would start from a standstill by pushing on my left pedal, there was a lot of pressure, and that didn't do me any good. But it also seemed that the saddle was a bit low, so last night I raised it by four inches or so. And today it was a whole new story! It seems to pedal easier, and I'm much more comfortable all round. No more knee pain on the bike, and much less off. In any case, I took Gem to nursery in it this morning and it was a great ride. We both really enjoyed it. I took a roundabout route home and tested it on some minor hills, and no problems at all! 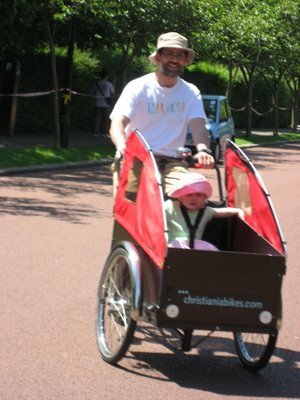 Now that Gem is starting to show signs of outgrowing the Bobike Mini (which will relegate her to the back on a Copilot or Bobike Maxi) and our return to the US is approaching, I've finally started to think seriously in investing in a Christiania trike. Our test ride a few weekends back and my conversation with the one of the founders (not to mention ongoing discussions with Andrea at Velorution) have also been pushing me in this direction. It was finally a new colleague of Andrea's at the Marylebone summer fair who gave me the idea to hire one out and see how we like it. Which is what we've done! I picked up a reasonably basic trike this afternoon at Velorution and rode it home. Today is Wednesday, and I'm planning on keeping it until Monday. That will give me lots of chances for runs to Waitrose with or without Gem, plus one and a half school runs (since I'l return it after drop-off Monday). The weather looks like it will cooperate as well, with no rain and temperatures in the high sixties predicted. This is a pretty basic model, but it does have some good features & more deluxe bits. 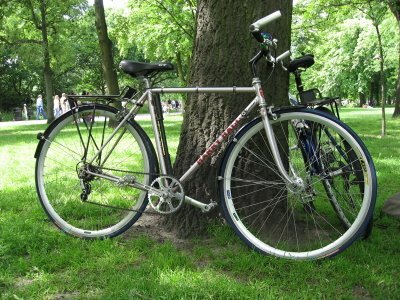 On the more basic side, it has a three-speed Shimano hub gear with coaster brake - fine, but really only for very flat terrain. The seat is also a bit basic, a padded, springy affair. The nylon bench seat for little passengers seems to work well enough, and there's nice (but unsecured) space underneath for stowing this and that. The safety belt is a single belt, which is okay for a child Gem's age, but not much younger. I'd go with a three-point harness on mine. The other obvious upgrade is the bright red colour, which I think Gem likes very much indeed! This takes a bit of getting used to. When I had my first try-out, Andrea warned me to lean into turns to avoid flipping over, which turned out to be good advice! I've managed to avoid any incidents on the road as well. At almost a metre across, it's a bit of a wide load, but that isn't really noticeable since the load is out front. As much as I've ridden with my trailer (about the same width), I still have close calls every once in a while - no such problems here. Perhaps the biggest difference from a normal bike is that it's articulated in the middle. The handlebar is a continuous length across the back of the box, and steering moves the entire front end. This means that it's veryresponsive and easy to turn in a tight circle, but this can be disconcerting at first. I expected going round corners to be different, but what I didn't expect was the subltle back-and-forth movement as I pedal. And still, not a big deal, it's just a bit disconcerting at first. It all feels quite stable most of the time, but going over bumps at speed can be a hair-raising experience that I've now learned to avoid. Another interesting foible has to do with the upright stance of the trike. Sitting on three wheels, it's always dead upright. So leaning round corners means that you lean, the bike does not. And when on a road that slopes off towards the curb, the bike rides at an angle. This is one of those things you never think about while riding on two wheels - you just stay upright even if the road is banked a bit. I don't mean to be too negative here - it really is a nice bike to ride; it feels very solid and well-made. It's clear that a lot of thought has gone into refining the design. It does take more work than riding a normal bike, but I stopped thinking about that once I decided not to try to keep up a normal pace. We had a brief foray to the playground yesterday - Kim walked and we biked a longer route. I removed the "bugatti" soft top to give her a good view all around, and back up at me. This is one of the nicest things about it. I've always thought it was wonderful that she had such a good view from the Bobike Mini and dreaded relegating her to the back of the bike. Her position on the bench of the trike gives her a great view, and she's still close enough that we can hear one another talk. Another thing I noticed straight away was that, instead of feeling like I'm being edged off the road constantly, on the Christiania it seems that drivers give me much more space. I think the road presence of the thing makes me more confident about taking my lane, and it also makes drivers keep their distance. I went along to a very nice event organised by Andrea at Velorution Monday, where the couple who founded and now run Christiania spoke. The Camden school travel plan guy and a couple London-based trike owners spoke too. A very nice event, and I'm now all the more enthusiastic about getting a Christiania trike! What fun! A gorgeous day, too. Nana, Papa, Kim, Gemma, and I walked down around noon had had a lovely day. The weather was perfect and sunny, and the park was packed. Not too packed, though. We started by visiting the bikey bit, which consisted of a Camden Cycling Campaign stand (my first time in four years not working! ), a cycle training thing, and a try-out area with recumbents and folders from Bikefix and a Christiania from Velorution. Gem and I had great fun riding around on the Christiania, and Andrea kindly adjusted his son's Like-a-Bike for Gem to ride (she's so keen now!). Papa also tried out a nice folder and had a good time at that. There was a gigantic turnout for Doctor Bike, with a long queue. We had nice sausages for lunch, then spent the rest of the day walking around and listening to music. Gem loves the blues, and the harmonica especially! Gem and I also met Jan and her lovely Harry Hall racer, lovingly assembled by her cycle-mad dad in Manchester. While I would like to have seen some swept-back handlebars and a nice Brooks saddle on it, the five-speed Campagnolo Record drivetrain and touring pedals were gorgeous and fit with the lugged Harry Hall frame perfectly! All in all, a beautiful package. I told Jan and her companion Darren that I'd post a picture of it, so maybe I'll have an email from one of them? Lots more photos on flickr! For what may be my last long ride for a while (baby due any day now! ), I yesterday I rode national route no 4 from Richmond to Windsor & Eaton. And remarkably, it was one of my best days of riding, ever! The weather was perfect, clear, and warm. I set off at first light around 4:30am and rode through Hyde Park to Richmond, where I picked up the marked route. Of course, not a soul in sight anywhere. The road through Hyde Park by the Serpantine wsa closed at that time, so I eeked in a pedestrian gate and made my way to the cycle path, taking some lovely photos along the way. (See flickr for lots of pictures from the ride. No problem getting into Richmond Park, thankfully, and I did my usual route across, seeing lots of nice deer in the morning mist. Then on to the Thames towpath, which took me pretty much the rest of the way. The surface was variable but nice and dry, and never mucky (one nice side-effect of the current drought!). I stopped for a ham sandwich at Hampton Court at 06:30 and continued along past Weybridge and Chobham, finally coming away from the Thames at Runnymeade. Runnymede is a large swathe of National Trust property with nice forest walks and tons of memorials, ruins, and old houses. Most notable for me was the only significant climb of the day, on the worst surface I encountered all day. Probably 10-12 percent. Not so bad, though, since I'd been riding along on towpaths for most of the day! Not too long after, I entered Windsor Great Park and spent the next 45 mins or so riding leisurely around the most beautifully-maintained roads I've seen. It's all royal, of course, so it's no surprise that it's kept up so well. It's essentially a huge and varied park, and the public has use of much of it. I was there around 8:30 or so, and the only people I saw were Crown Estate workers and the odd jogger here and there. I got some water and used the loo at the one little shop in the one little village, which was as cute as could be. Windsor Great Park must be one of the best places for family cycling in the South East. I hope to be able to come back with Gem in the trailer or child seat and spend the day. The only slight downside is that the way markers for the national cycle routes aren't marked inside the park. After that, there's another nice parkland ride towards Windsor, but after that the markers become really poor. I got really turned around and ended up following an A road into the centre, but that's not a major issue. After only a short break, I walked over a bridge and rode through Eton, where I found my only Sustrans waymarker of the day. I probably should have gotten on the train there and connected through Slough, but instead I decided to ride to Slough... which only served to confirm for me that Slough deserves its reputation as one of Britain's worst towns. I've said enough about that. But that wasn't enough to sully day for me! Important note about route 4 The most recent Sustrans map shows a long route that continues along the Thames after Weybridge that was not approved at the time the map was made. It is now approved, and signs on the street reflect that route, not the one on the map. Hooray! Nana Dawn has arrived in anticipation of the new baby. And she's brought goodies! Among them, a nice, new Canon digital camera. It's much more portable than our SLR, and it also does video. Which I tested out this morning on the school run. I have a little vise mount that I attached to my handlebars and set it going as we left home. The mount isn't very good quality, so I had to adjust it a bit as we went along. But the camera is brilliant, and the giant display on the back fascinated Gem and made her feel like a right little Stephen Spielberg. As I get better with the camera and all that, I'll be doing more video!